We are delighted to stock a great range of SEEDBALL's wildflower mixes. They really are A Simpler Way to Grow From Seed , and make great gifts too. 20 balls per tin, 30 seeds per ball. Simply scatter on top of soil in a garden bed or planter. Scatter in spring or autumn. Sprouts seen in 4-6 weeks. Seed balls are a great permaculture technique for growing seed in a more simple and effective way. Growing wildflowers from seed can be super challenging - they are slow to germinate and grow, and as a result are especially vulnerable to seed and seedling predators. Each seed ball contains a mini ecosystem: seeds are mixed with clay, peat-free compost and a smidgen of chilli powder, and rolled into a small ball. Each ball is approximately 1cm in diameter, making them super easy to scatter. The dried clay acts as a protective casing from common seed predators (such as ants, mice and birds). When sufficient rain permeates the clay, the seeds inside begin to germinate - helped along by the nutrients and minerals contained within the balls. The chilli powder continues to deter predators while the seed ball slowly degrades and the seeds sprout. Seed balls will work well in most environments (as long as the seed is well suited to the local climate and soil conditions) and they'll work as well in planting pots as in garden beds. A ball made from seeds, clay, peat-free compost and chili powder. The ball prevents the seeds from being a tasty lunch for birds and insects, thereby increasing the chances of your flowers growing. Plus they're super easy to use, no digging and no expert knowledge needed! 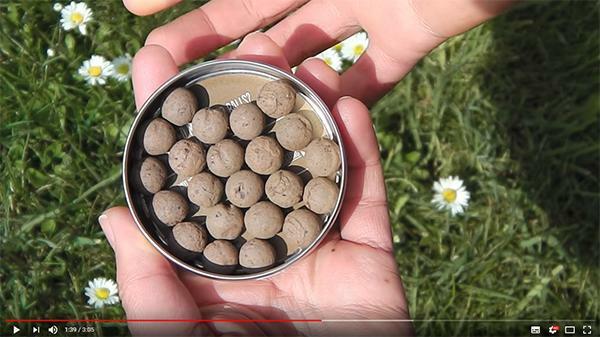 There are 20 balls in each tin, and around 30 seeds per ball. How do I grow Seedball? Just throw onto soil or compost in a garden bed or planter. Your Seedball has everything it needs to grow and, once the ball becomes moist and the temperature is right, your seeds will germinate! What area will my Seedball cover? We would usually advise 20 seed balls per square metre, or 3-5 seed balls for a 35cm container. Conservation: All seed is responsibly sourced in the UK from Flora Locale accredited suppliers, we only ever use peat-free compost and our steel tins are manufactured in London (with the help of a solar farm on the factory roof). All compost used is peat-free. All seed is Flora Locale accredited. Our tin packaging is manufactured by the last tin maker in London and powered with the help of a solar farm on the factory roof! Tin is also highly recyclable and reusable. In fact, if you send us your empty tin and a self-addressed and stamped envelope, we'll re-fill it for free! Our office balcony and window boxes are filled with wildflowers (from seed balls of course!). We donate all seed ball miss-shapes to school or community projects. Seedball is a trading name of Project Maya, an eco-social enterprise working to build a global network of conservation and sustainability reserves. We were founded by conservation and sustainability scientists, so it's unsurprising that we're also supporting further research on seed balls!